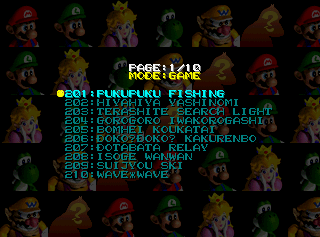 Mario Party 3 continues the trend of using a similar debug menu, just like Mario Party and Mario Party 2 before it. The debug mode consists of minigames and a crude character select. It should be worth noting that the pages contain inaccessible entries, labeled in green . Accessible entries are in cyan . All inaccessible entries are blank. Mario's Puzzle Party Pro is the only minigame to not appear in this debug mode. 260 Item Hitter Hey, Batter, Batter! This page doesn't contain any minigames. 296 Result2 Result screen, but for what mode? 300 Mchar Goes to a character model debug mode. This page was last edited on March 15, 2019, at 19:11.